I'm usually not one to discuss positions in businesses we own until after I have exited them, but since I have readily discussed Premier Exhibitions (Nasdaq: PRXI) to the investors of Gad Partners Fund in numerous letters to partners, this information won't be new to any of them (or many others who have followed PRXI for that matter.) Besides, if all goes well, the thesis will play out in a manner of months. Even still, there is a high probability that shares remain significantly undervalued. NOTE: The Gad Partners Fund as well as personal accounts of Sham Gad have established positions in this security at prices, that in most cases, are significantly below today's market price. Premier is a provider of high-quality museum-type exhibitions. The company's two best-known exhibits are BODIES and TheTitanic. The value-creating catalyst resides in the Titanic assets. Premier's subsidiary owns approximately 6,000 Titanic artifacts, acquired through years of diving and exploration. It is those assets that provide the current catalyst that will drive the company's valuation higher in the very near future. In December 2011, Premier announced its intent to auction off its Titanic assets in April 2012, the 100th anniversary of the ships sinking. For more than 10 years, Premier has been involved in litigation regarding the title to those artifacts. Last August, a court finally awarded Premier the remaining set of artifacts it did not own. During that legal process, professional appraisers valued those artifacts in excess of $110 million. Those artifacts, along with the others in Premier's possession, are collectively worth $190 million. Premier is debt free and has a market cap approaching $100 million. News of the Titanic auction did not move shares much -- a signal that the market believes that the auction will not even fetch appraised value for the assets. I believe the market has it wrong; in fact, it's likely that the auction will result in a sale price in excess of the appraised value. In October 2011, Phillip Weiss Auctions offered artifacts from a couple who were honeymooning on the Titanic. Those artifacts were estimated to fetch between $30,000 and $50,000. Those artifacts sold for $100,570. That same month, England's Henry Aldridge & Son auctioned several Titanic artifacts, including a deck plan of First Class Accommodations used by a survivor. It was estimated that the deck plan would fetch between $50,000 and $80,000. The final sale price was more than $150,000. Premier, in all likelihood, is going to reside over one of the most highly publicized and significant auctions in decades. At the appraised price of $189 million, shares are worth $4 before you include the company's intellectual property or exhibition business. That's 120% upside in four months. If the auction goes better than expected, then you can see how incredible the upside is. I have spoken with management on numerous occasions. They get the tax issue and are squarely focused on managing any taxable transaction in order to maximize shareholder value. Is there a chance that the auction doesn't succeed? Sure, there is always an element of uncertainty involved in any investment thesis. But if you look at PRXI's track record since Mark Sellers took control, they have accomplished everything they set out to do with respect to the Titanic assets. I for one, ascribe little value to the exhibition business for purposes of the valuation, but keep in mind that the exhibition business could be of enormous utility to anyone who owns the artifacts. Successful investing requires building mental models and using those models to construct a story. In the case of Premier, one has think of who might be interested in owning not merely assets of a sunken ship, but arguably the most historic maritime tragedy in the world. A 15 year court saga is merely but one clue as to how significant these assets are deemed. At one point, Jerry Jones, owner of the Dallas Cowboys, was interested in having the massive Titanic hull at the new Cowboy stadium. In terms of historical significance and public curiosity, Titanic is right up there with King Tut, the most successful exhibit of all time. Use your imagination as to who want to own such a collection. My initial thought is that some affiliation with a museum or philanthropic organization is what will happen. I like to get really creative and think that a Steve Wynn type buyer could really be interested and bring this collection to his casinos. By definition, an auction of any kind is a bet on an uncertain outcome. Auctions can and do flop. Investing is ultimately a probabilistic bet. I deem a worst a case scenario being the assets get sold at appraised value with a tax hit: in that case shares are probably worth 10% to 20% above the current price. Given management's keen focus on structuring any sale in the most advantageous manner suggest that even a worst Case outcome will be better than my assumptions. An interesting point to keep in mind: because shares trade below $5, many mutual finds are prevented from owning shares. A reverse split could change that dynamic very quickly. Disclosure: Both Gad Partners Fund and Sham Gad hold a long position in PRXI. Corporate attorney Derek Bork at Thompson Hine recently released a gem of an article on shareholder activism. The article is a fascinating insight into one of the most intriguing aspects of investing today. Shareholder activism is not only the Carl Icahn type procedure you see today. 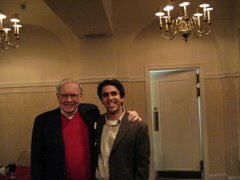 Buffett in his early days was a huge activist in many of the investments he made for the Buffett Partnerships. Most importantly, Mr. Bork's article is a refreshing illustration that successful activism is not only an arena for the large institutional investor or hedge fund, but for the smaller investor as well. With having a clear strategy and plan in mind, activism can clearly back fire, costing investors valuable time and money. Small or big, anyone interested in activism would be well advised to consider the blue print laid out by Mr. Bork. "One of the biggest mistakes that some activist investors make is engaging in activist tactics without a clear strategy. It is easy to see the tactics that other activists use in the marketplace, but it is not always clear on the surface why they are using them. The tactics that an investor should use may vary widely from one situation to another, depending on the circumstances of the company, its legal defenses, the size of the investor’s position, the make-up of the shareholder base and other factors."